This Colonial Armoire is elegantly designed using Old World Craftsmanship techniques that have been used for hundreds of years. Please call to speak to one of our Amish furniture specialists with questions on this beautiful Early American reproduction furniture. In today's world of imported and cheap furniture you don't see as much quality, handcrafted furniture. This is why DutchCrafters furniture was created. To sell the amazing quality furniture from our master Amish craftsmen. We are proud of the furniture that we sell. It is what we carry in our own homes! This Colonial Armoire is an example of the type of furniture our master craftsmen built. Whether you place this hardwood armorie in the bedroom, living room or office it is sure to impress. Choose between Chippendale or brass bail hardware. The drawers are dovetailed for years of everyday use. 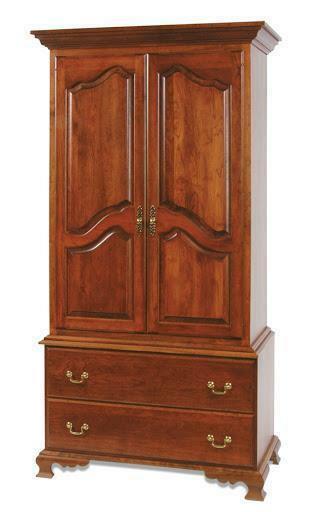 This Armoire is available in oak wood, cherry wood, or brown maple as well as a variety of finish options.